Democratic presidential candidate Hillary Clinton promised offered a scathing rebuke of her Republican rival in a speech before the Veterans of Foreign Wars annual convention on Monday, calling his policies dangerous and his outlook poisonous. "If we retreat on security or the economy behind an imaginary wall, we will have lost our leadership, our purpose, our chance to prevail in the 21st century," Clinton told the crowd of veteran leaders, without ever mentioning Donald Trump's name. "If America doesn't lead, we will leave behind a vacuum." Trump will have his chance for a rebuttal at the VFW convention Tuesday morning. VA Secretary Bob McDonald, who has been a frequent target of Trump, is also scheduled to speak just before the Republican nominee. Clinton's VFW The North Carolina speech in Charlotte, North Carolina, delivered as about 500 miles south of the opening morning of the Democratic national convention opened about 500 miles north in Philadelphia this week, touched on Clinton’s previously already outlined plans for reforming the Department of Veterans Affairs. She promised to reduce cut down on veterans’ wait times for medical care, improve coordination between of military and VA health care coverage, boost programs for female veterans and to "end the epidemic of veteran suicide." if elected to the White House. Clinton also pledged to simplify troops' make transitions from the military to civilian jobs easier, and to protect the post-9/11 GI Bill benefit, calling congressional plans to trim the benefits "not just wrong, but short sighted." But the majority of Clinton's speech was a rebuttal to the Republican convention in Cleveland last week and Trump's own campaign promises to vastly expand medical care access for veterans outside the VA.
Democrats have repeatedly labeled that a dismantling of the VA system, and Clinton did so again on Monday. "We are not going to privative VA," she told the crowd, eliciting scattered cheers. "We are going to reform it, and make it work for every single veteran in America." 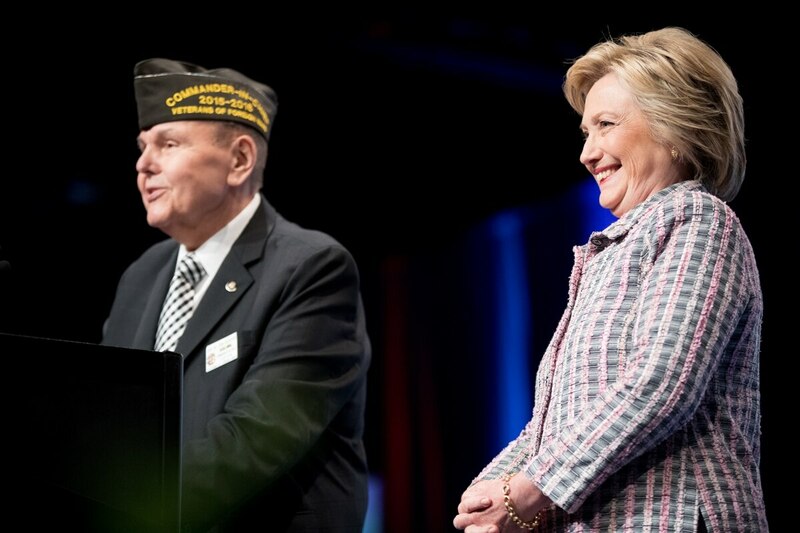 Clinton cast herself as a long-time advocate of veterans issues, dating back to her service in the Senate. She called Trump a "newcomer" on the topics and cited multiple campaign gaffes by the business mogul, an effort to paint him as irresponsible and untrustworthy. "One thing for certain you will never hear from me is praise for dictators and strongmen who have no love for America," she said. Our troops "deserve a commander in chief who will never force them to commit war crimes. ... You will never hear me say that I only listen to myself on national security." Republicans have pushed back on those statements, calling Clinton the less credible candidate. They cite because of her past history of scandals, including the deadly involvement in the deaths of U.S. personnel in the 2012 attack on American diplomatic embassy facilities in Benghazi, Libya, which occurred during her tenure as secretary of State. But Clinton promised to be a commander in chief "who honors your service, not just with words but deeds." That includes restoring veterans faith in the VA, saying she has been outraged by recent missteps by the agency and dismayed by veterans' eroding faith in the institution. "I know a lot of vets still feel invisible, powerless, like their country have forgotten them," she said. "That's wrong. We have to make sure we end that."